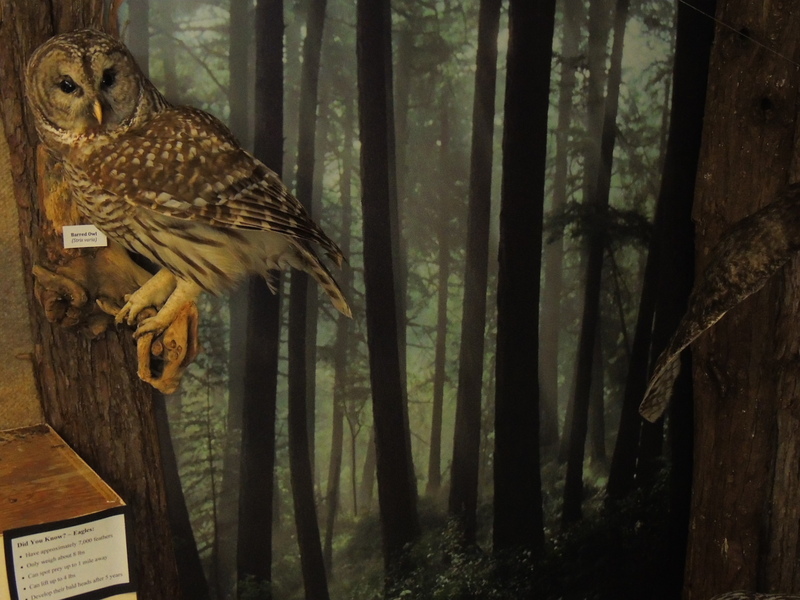 This November we are featuring the beautiful barred owl perched in our raptor exhibit. This barred owl was added to the collection in 1998. It was found by John Fletcher on his Hornby farm, “The Apple Orchard”. Barred owls have dark eyes, brown horizontal bars on the chest, and vertical bars on the belly. Their distinctive call is often “translated” as “Who cooks for you… Who cooks for you-alllll?” If you try calling to one, it likely will call back to you! These owls are the most common species of owl on Hornby Island and their call is often heard both day and night. They are mainly nocturnal, and prey on small rodents, birds, frogs, insects and fish. They nest in cavities (or holes) in trees. Barred owls lay 2-3 eggs that hatch in about a month. The young owls are fledged in 4-5 weeks. Pairs mate for life, and the young usually disperse only a short distance from their parents’ territory. The only predators of the barred owl are great horned owls and humans. A young barred owl on Hornby Island is seen in the video below. Learn about and hear the barred owl’s distinctive call in the following video. I love your website! It’s easy to read, filled with great images and it’s clear. Might have to get involved. Thanks, Phyllis! We’d be delighted to speak to you anytime about getting involved with the NHC.